STOCKHOLM--(BUSINESS WIRE)--THE latest version of a hand-held device to help people improve the self-management of ongoing lung conditions is being launched this month. With its use of Bluetooth wireless technology, the new Air Next is among the world’s most advanced home-use spirometers. Spirometers are devices that allow users to measure how well their lungs are performing. 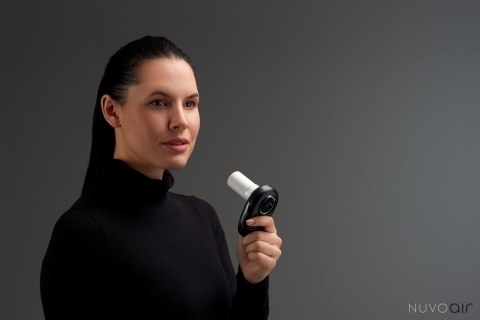 This new spirometer has been developed by Swedish digital health start-up company NuvoAir. It’s a major step forward from its previous device, the Air Smart Spirometer, which has been available since 2016. 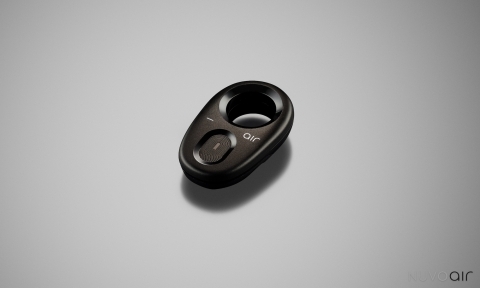 The Air Next itself is a sleek design that fits into the palm of the hand. However, its manufacturer has made it more robust than its predecessor. But despite using today’s most advanced technology, the Air Next will cost 165 EUR (excl. VAT), only a fraction of the price of most standard spirometers found in hospitals and other clinical settings. The Air Next is easy to use for those living with life-long lung conditions such as asthma, chronic obstructive pulmonary disease (COPD) and cystic fibrosis. It measures all of the same parameters that would be recorded by medical professionals. This includes the FVC (forced vital capacity) measurement test, which shows the volume of air that is exhaled during a forceful complete expiration, starting from a full inspiration. And FEV1 (forced expiratory volume), recorded at the same time, reveals how much air is breathed out in one second. These and other findings reveal how effectively a patient’s lungs work compared to someone of the same age with a ‘normal’ functioning respiratory system. Lorenzo Consoli, CEO of Stockholm-based NuvoAir, believes the Air Next will make home-use spirometers more accessible to those who need them the most. Last month the Air Next, which is a class IIa medical device, was given a CE mark and it’s now available for sale across Europe and other major markets around the world. Headquartered in Stockholm, Sweden, NuvoAir combines hardware, software and data to improve lives of people suffering from respiratory conditions and to enable better and faster clinical decisions. Early in 2017 NuvoAir received Euro 2M in seed capital from Investment AB Spiltan, a leading Venture Fund in the Nordics.